Over the years, JRF’s endeavour for excellence has been recognized by globally renowned organizations and we would love to share some of our recent accolades with you. 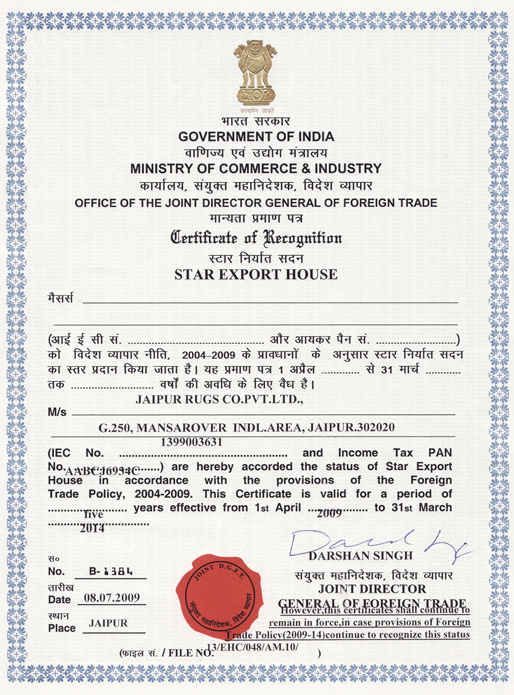 Jaipur Rugs Company Private Limited was conferred with STAR EXPORT HOUSE. This is a recognition by the Director General Foreign Trade, Ministry of Commerce, Government of India for stupendous export performance over the years, its continual growth in turnover and earnings from export of goods. The star export house recognition is given to organizations for continual growth and stability in the export performance over the years in efficient management system. ISO 14001 is an internationally accepted standard that sets out how you can go about putting in place an effective Environmental Management System (EMS). The standard is designed to address the delicate balance between maintaining profitability and reducing the negative environmental impact. This award is to ensure compliance with environmental legislation and reduces the risk of penalties and possible litigation. 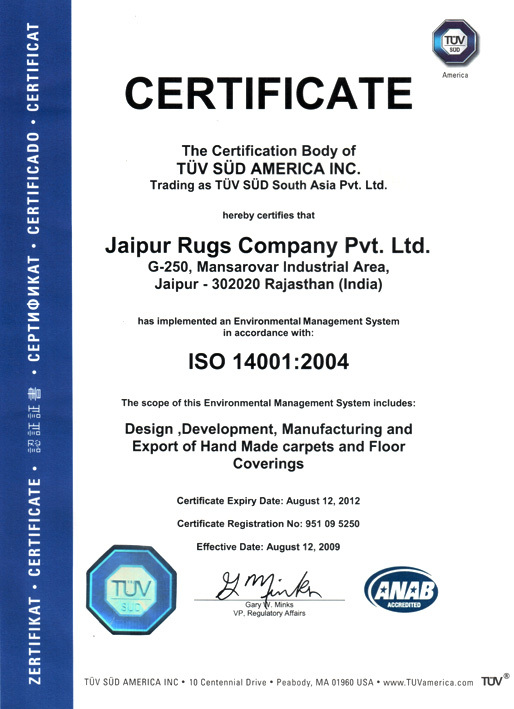 ISO 9001:2008 certifies quality and Jaipur rugs is a certified company for its quality production standards. The reason of our progressive growth is our range of quality products which are accepted globally. A quality management team to supervise the quality checkups by the time of production and before shipment of the products. We always strive to provide our clients quality products and get the maximum customer satisfaction by providing world class customer service. 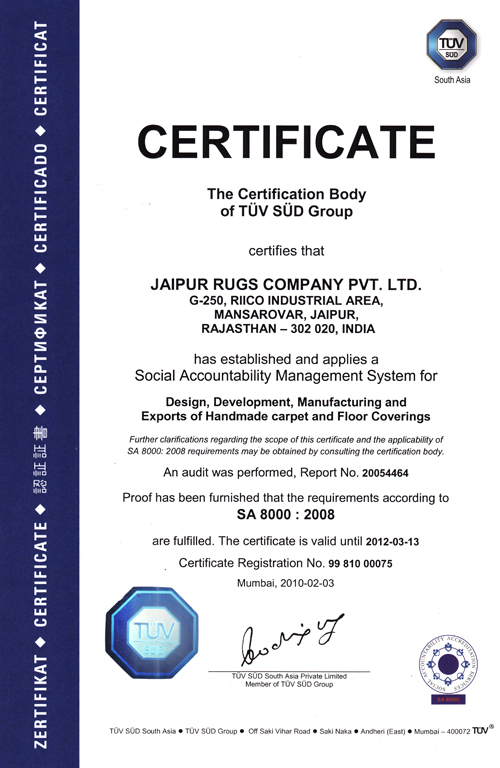 SA 8000 : 2008 Jaipur Rugs is the first company in India with “Design, Development, Manufacturing and Export of Handmade Carpets and Floor Coverings” scope and 11th carpet company to receive SA 8000 certification in India. This certification is given as a recognition of its functioning with 40000 people from the remote distant areas, who are working well within governmental norms and in an efficient management system. SA 8000 is an internationally recognized standard based on International Labor Organization (ILO) conventions and the United Nations’ Universal Declaration of Human Rights and the Convention on Rights of the child. 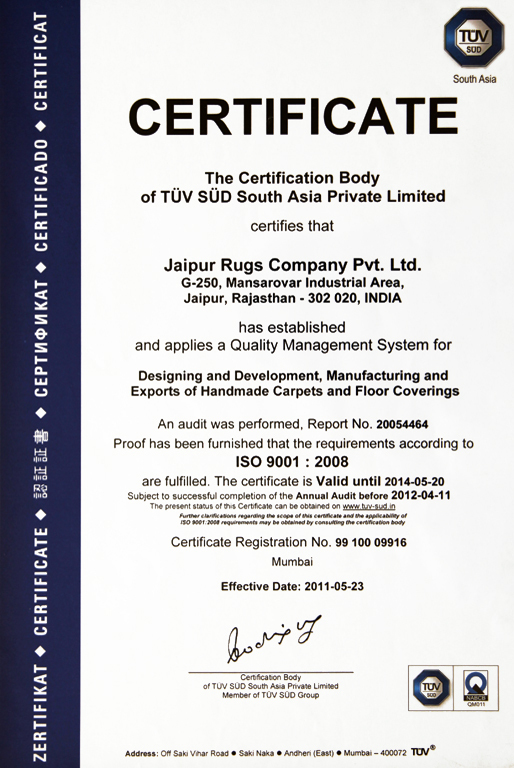 Jaipur Rugs Company private limited received the DUN & BRADSTREET certification. Jaipur Rugs Company, as a socially responsible company, strictly ensures that no child labor is involved in any process of our carpet manufacturing. 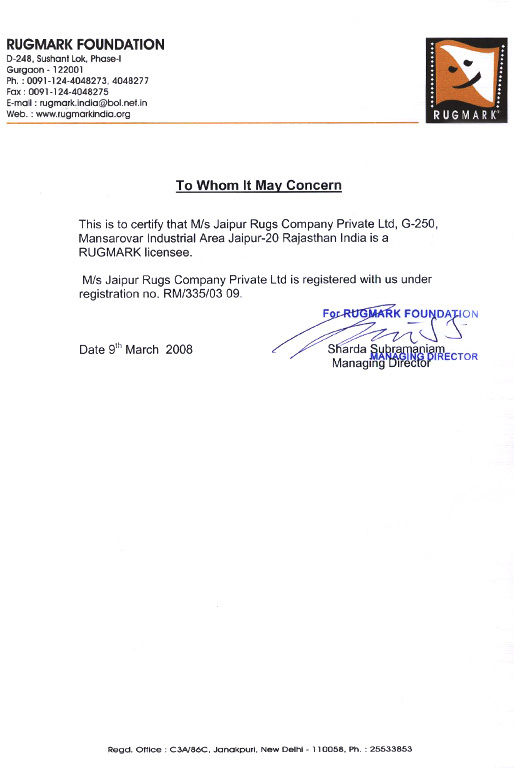 As a Child-Labor-Free Rug Mark Licensee, Jaipur Rugs binds itself to the contract with Rug Mark Foundation to produce rugs without involvement of child labor, to register all looms with the Rug Mark Foundation, and to allow access to looms for unannounced inspectors.